A new paper concerned with the dynamics of conscious and non-conscious cognitive processes on behaviours in the workplace environment, is released. 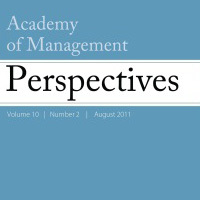 Hodgkinson G., and Sadler-Smith E.
“This article contributes to the growing body of research and scholarship in management and organization studies (MOS) concerning the dynamics and impact of conscious and nonconscious cognitive processes on individual and collective behavior in the workplace. Dual-process theories have occupied the center ground of this literature. However, in recent years, the field of psychology, in which these theories originated, has differentiated two fundamentally different categories of dual-process theory—default-interventionist and parallel-competitive. These alternative conceptions are predicated on incommensurable assumptions but MOS researchers are seemingly oblivious of this important distinction, risking the development of a body of work that is fundamentally incoherent, being predicated on psychological foundations that are untenable.